Friedrich A. Hayek is regarded as one of the preeminent economic theorists of the twentieth century, as much for his work outside of economics as for his work within it. During a career spanning several decades, he made contributions in fields as diverse as psychology, political philosophy, the history of ideas, and the methodology of the social sciences. 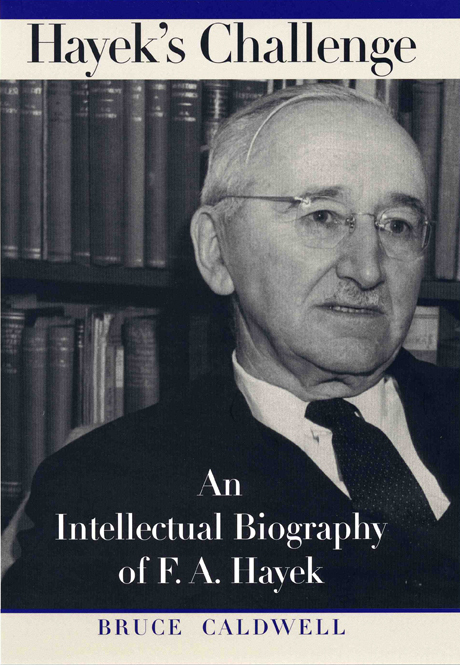 Bruce Caldwell—editor of The Collected Works of F. A. Hayek—understands Hayek’s thought like few others, and with this book he offers us the first full intellectual biography of this pivotal social theorist. Caldwell begins by providing the necessary background for understanding Hayek’s thought, tracing the emergence, in fin-de-siècle Vienna, of the Austrian school of economics—a distinctive analysis forged in the midst of contending schools of thought. In the second part of the book, Caldwell follows the path by which Hayek, beginning from the standard Austrian assumptions, gradually developed his unique perspective on not only economics but a broad range of social phenomena. In the third part, Caldwell offers both an assessment of Hayek’s arguments and, in an epilogue, an insightful estimation of how Hayek’s insights can help us to clarify and reexamine changes in the field of economics during the twentieth century. As Hayek’s ideas matured, he became increasingly critical of developments within mainstream economics: his works grew increasingly contrarian and evolved in striking—and sometimes seemingly contradictory—ways. Caldwell is ideally suited to explain the complex evolution of Hayek’s thought, and his analysis here is nothing short of brilliant, impressively situating Hayek in a broader intellectual context, unpacking the often difficult turns in his thinking, and showing how his economic ideas came to inform his ideas on the other social sciences. Hayek’s Challenge will be received as one of the most important works published on this thinker in recent decades. "Guides are needed, and Bruce Caldwell’s Hayek’s Challenge is a welcome introduction." "Caldwell’s approach to the task of deconstructing Hayek’s intellectual influence is an original one. . . . It is the intellectual voyage that interests Caldwell. . . . He charts his lengthy struggle with multiple equilibria and attempts to reconcile what have often seemed inconsistencies in his thinking. And, he shows how Hayek’s interests, in later life, shifted away from pure economics and towards political theory and philosophy. . . . His exegesis of Hayek’s main works is outstandingly lucid and may bring his ideas to the attention of a new generation of students. . . . Hayek’s Challenge can be recommended to both the specialist and general reader." "Bruce Caldwell’s intellectual biography of the great Austrian is a wonderful work." "A carefully written, impeccably researched, and thoughtful book that is sure to become a standard in Hayek scholarship." "A finely nuanced addition to the literature of which [Caldwell] has such a fine command. The study represents a landmark in studies of Hayek and the development of Austrian economics for either of which it will long remain essential reading." "A significant contribution to philosophy and to economics. . . . Caldwell has wrestled with several complex themes in Hayek’s philosophical writing and has provided us with an indispensable guide." "A good place to start with if you want to understand or even emulate Hayek." "Caldwell’s pleasant and engaging book is an enduring contribution to Hayek scholarship.. It should be of interest outside the world of Hayek scholarship, too. Hayek has as good a claim as anyone to be the most important economist of the 20th century. . . . . Besides the excellent history of the early Austrian school, besides many particular insights and facts, the book has one great merit that more than suffices to make it a valuable contribution . . . its emphasis of the role of complex systems on Hayek’s thought."